What does Sound Healing look like? Sound Healing treatment reverses the flow of consciousness from the outside inwards, towards our source, higher self, void. 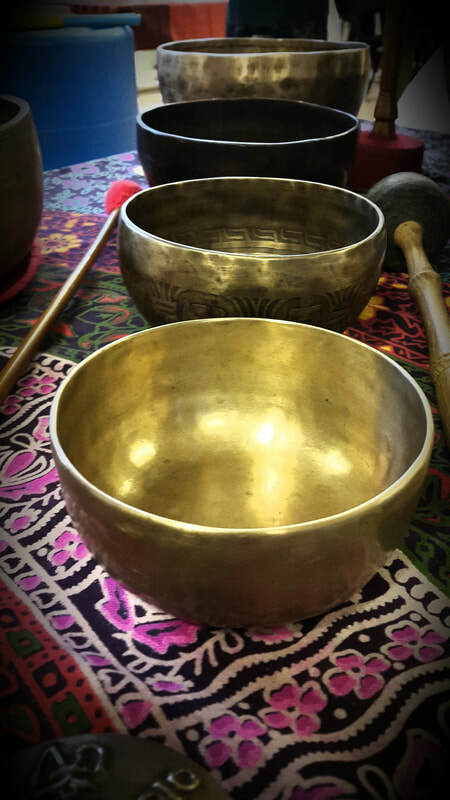 Sound Healing treatments with Himalayan singing bowls and gongs combine deep relaxation or meditation with subtle sensations felt all over the body. Healing frequencies can give you exactly what you need at the particular moment: creative solutions, artistic inspirations, good night sleep, relax, inner peace, pain relieve or they can just lift you up and make you cheerful and energised. Sound Healing can trigger feelings of de-materialisation, floating, process of rejuvenation (when you have ecstatic feeling of fullness and life energy), inner peace, timelessness and feeling of your consciousness not being bound only to your body. Vibration is known to have an analgesic effect and is often used in the treatment of chronic pain. Studies suggest that vibration might interfere with the transmission of pain signals from various parts of the body to the central nervous system (1). To fully benefit from the treatment is to come with an intention in your mind, which will be send to the Universe on the waves of sound. As American sound healing pioneer Jonathan Goldman said: "sound + intention = healing". Usually treatments are received lying on the massage couch, covered with the blanket. It is advisable to wear comfortable, loose clothing, warm socks and no metal accessories. Please drink plenty of water before and after the treatment to aid cleansing and healing process, which is usually ongoing and keeps making a continuous progress for the next few days or even weeks. During an individual Sound Healing session I place the Himalayan singing bowls directly onto your fully-clothed body for an optimal physical sensation, so the healing vibrations can be perceived to the maximum. Then I gently begin to tap the bowls to create a soothing sound and soft vibration. Strong resonance in our body makes us feel as if we are being massaged from the inside out. During the treatment you will be bathed in a sea of relaxing and soothing sound healing frequencies that will melt away your stress and rejuvenate your body, mind and soul. You may experience a light, trance-like state, comparable with other forms of meditation. Although the Himalayan singing bowls are positioned directly onto your body, it doesn't affect your ability to switch off and relax. Sound Healing is exceptionally relaxing. It is very comforting for pregnant Mamas and all individuals with busy and exhausting lifestyle. To book your Sound Healing treatment, please click the button below.